Balance is more than just mental focus and standing on a single leg or walking foot over foot, it requires engaging the core and controlling the overall stability of the knee, hip and ankle. According to the American Council on Exercise, "balance not only requires equilibrium, but also good stability of the core muscles and joints, particularly the hip, knee and ankle". Adding a balancing component to traditional exercises is an excellent way to enhance the effectiveness of those exercises. Designed to mimic the benefits of a stability fitness ball, the all-steel Balance Board Station is finished in a durable powder-coat and topped with a marine grade plastic to create a safe, slip-resistant surface that is able to be used as a stand-alone station or in conjunction with other cardio or outdoor fitness equipment. The round Balance Board Station offers a fun, versatile workout to all skill levels. 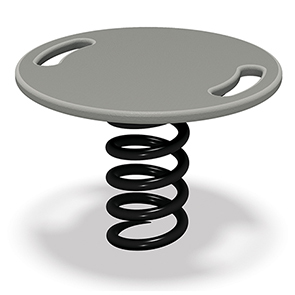 The coiled spring base supports the round slip resistant balance board, which wobbles and flexes to make users focus on body positioning while performing exercises like squats, push-ups or yoga positions. The variety of exercises that are able to be performed on the Balance Board tones muscles, burns calories and helps improve muscular health and stability.